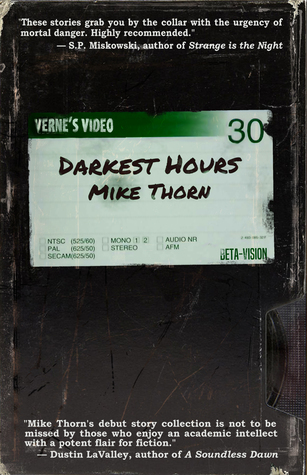 Darkest Hours is a collection of 15 short stories that run the gamut of the horror genre. No two stories are alike. If I’m being honest, Mike Thorn scared me with quite a few stories. I had to stop reading three stories due to the fact that I was reading in the dark. I had to cover a mirror and keep the bedside lamp on. The collection kicks off with Hair. This story thoroughly grossed me out. It’s about a guy named Theodore who has a fetish for his own hair, which he ingests. Mictian Diabolus is a scary read. “Mictian Diabolus… Mictian Diabolus…” The chanting grew louder, the squishy skinless feet stepping nearer and nearer. I can still picture this story in my mind. A New Kind of Drug freaked me out. The imagery alone is enough to please any horror fan. The story has teen angst throughout. It’s long on dread. The story is told from the girlfriend’s point of view, which makes it even better. Party Time surprised me! I didn’t see it coming! Mired contains a blob. Great throwback to the classics. The Auteur is about black magic and horror filmmaking. Choo-Choo is about two friends who go to the local train yard. To me, Fear and Grace is the weakest story in the collection. Long Man genuinely scared me. I had to cover a mirror while reading the story. There was something like a man in the mirror. Economy These Days is about a brutal workplace. The company gives their employees the opportunity to make a good living, but it comes at a terrible price. Sabbatical is great. The details in this story are great. The knobby spine scene reminds me of the sister from Pet Sematary. Also, there is a trippy scene where the characters are not as they seem. Satanic Panic is very much a creature feature. A great creature feature. That ending has it all! Speaking of Ghosts is an excellent ghost story. Lucio Schluter is about creating art in the most sinister way. Fusion is about a camping trip gone terribly wrong. The campers try to get at the root of the situation. Remembering Absence is about a guy who recollects his own untimely death. I thoroughly enjoyed this debut collection by Mike Thorn. Each story is different, which makes it that much better. He brings academia and different types of horror together. I had never heard of Mike Thorn before reading this collection. He has a bright future in horrorr and I can’t wait to read his forthcoming work. The pages are filled with tentacles and other monstrosities. The stories are clever and witty. The characters are all too real. The monstrosities are smart. The dialogue is great. Mike Thorn’s writing style is solid as well. The first story grossed me out too. Gyerk. Just the idea. Nope. Nope Nope Nope Nope.